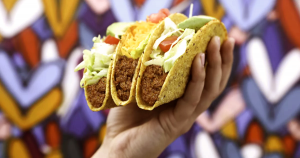 The American chain franchise Del Taco just announced that it will be the first fast-food taco joint to sell plant-based Beyond Meat as an alternative to beef, starting on April 25. The move doubles the number of fast food chains to feature plant-based meat alternatives from one to, uh, two — earlier this month, Burger King announced that it had partnered with Impossible Foods to create meatless Whoppers. Now, with Del Taco working with Beyond Meat, plant-based meat alternatives have a real shot at going mainstream, according to Vox’s analysis. Del Taco and Burger King are sourcing their meat alternatives from different companies, but the competition doesn’t concern Ethan Brown, Beyond Meat’s founder and CEO, who told Vox that he’s happy to see the meat alternative market grow. Moving away from beef farming could help lessen greenhouse gas emissions and promote animal welfare — so now hangover tacos can help you feel better in more ways than one.